Looking for the best cash for cars in Tennessee? Look no further than The Clunker Junker! You'll be paid right on the spot by one of our awesome Tennessee junk car buyers. We don’t expect our cars to last forever, but when your car smokes more than the Smokey Mountains, it’s almost impossible to get rid of it. Tennessee might be known as “The Volunteer State” but you don’t want someone to volunteer to take your car away. You want them to pay you! Before you resign yourself to a Craigslist ad, check us out at Clunker Junker instead. We pay cash for cars in Tennessee and pick them up completely free of charge! When it comes to doing things well Tennesseans know all about that. They do BBQ so well, they’ve got an entire BBQ style named after them. People come from all over the country just to try some Tennessee style pulled pork. They won’t however come from all over the country to check out your junk car. Whether your car is no longer looking fantastic or it’s met the same fiery death as Elvis Presley’s first pink Cadillac, you can let us do what we do well, and get you cash for your junk car in Tennessee. Anywhere from Music Row to Smokey Mountains National Park, The Clunker Junker is there to get you cash for your car in Tennessee. Plus, we’ll do it faster than you can sing your favorite Dolly Parton song. Just follow our steps below and you’ll be moments away from getting an instant cash offer. As our favorite former Tennessee resident would say, “Thank you very much!”. Whether you’re in Nashville, Knoxville, or Memphis, The Clunker Junker will buy your junk car and take it off your hands. It’s easy to sell your junk car in Tennessee following these three steps. These processes are a surefire way that you’ll get top dollar for your junk car without any extra effort on your end. To get started, go to our website and fill out our easy form. We'll ask for your make, model, year, and the condition that your vehicle is in. If you don't have a title, no worries! We pay cash for junk cars with no title needed in many cases. However, we can't buy every car without title so let us know first. Other Tennessee junk car buyers just can't compare to the Clunker Junker, we give you a cash offer instantly. We work with some of the best professional junk car buyers that will guarantee the most cash for your car in Tennessee. Our convenient pick-up service is free and flexible to your schedule needs. At the office? Home? At a friend's house? Let us know and our junk car removal specialist will arrive to pick it up! All you need to do is exchange your keys, signed title and vehicle for a payment of cash or check. After that, you can sit back and relax while we do the rest, making us the best in Tennessee for junk car removal. Cash for junk cars in Tennessee you say? How much will I get? We offer to buy your junk car for cash and each car will have a different value. To best decide what your car may be worth, check out these three groups. Which one does your junk car fit into? These are the cars that are worth their weight in scrap metal and nothing more. That’s right, these junk cars are crushed and sold to auto salvage yards, price is dependent on size and weight, but you’ll usually see anywhere from $50 to $225 for vehicles in this category. These aren’t in the worst condition, but they’re not the best. Useful parts will be salvaged before the rest of the body is crushed for scrap at the junk yard. We pay better rates for these vehicles. Even though they’re not junked, we’ll still buy them! Nice cars that run well, stay in good condition and price well at auction will get better price ranges. Expect up to $15,000 for vehicles like this. You won’t find that kind of pricing at a junk yard. 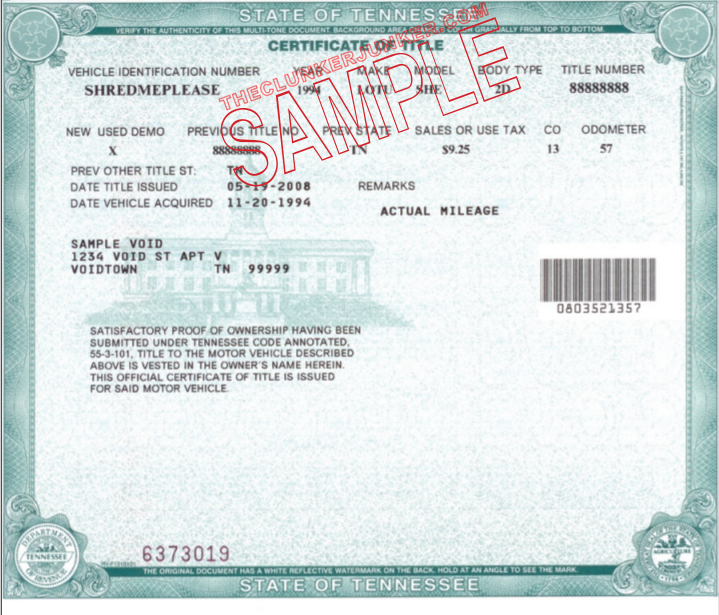 We have put together a simple guide and example for how to sign your Tennessee title when you are selling your vehicle. If there are multiple owners listed on the title, they must all sign the title unless the names are separated with "OR". When signing your Tennessee title, look for the section that says "Assignment of title by registered owner". This is where you'll want to sign and print. Ignore any section that says "licensed dealer", you won't be needing those. 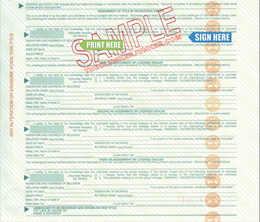 First sign and address the back of the title where indicated by "Signature and address of seller(s)"
Print (don't sign) your name on the back of the title where it reads "Seller(s) name (hand print)". 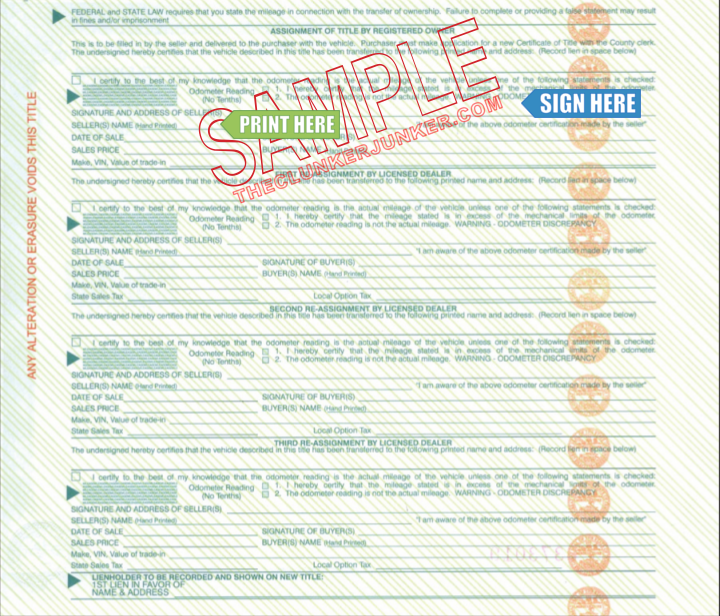 Fill out the Tennessee Application for a Duplicate Certificate of Title. Bring your duplicate title application to your local county clerk's office or mail your application and processing fee to your local county clerk's office.. Please note that there may be waiting period before a duplicate title can be issued and the cost is $11.00. (Paid to the TN department of revenue). Getting rid of an abandoned vehicle in Tennessee can be a difficult process. Unfortunately, you cannot just sell any junk car that ends up on your property if you do not own it. You'll need to follow the Tennessee abandoned vehicle removal procedures. We have given a general overview of what that entails below. You may not apply for the title to the abandoned vehicle. If no previously registered owner and/or lienholder shows interest in the vehicle after a (25) twenty-five day hold, the vehicle may be sold by the storage facility housing the abandoned vehicle. Can you buy vehicles in Tennessee without title? Yup! We buy cars without title everyday. We can’t buy every car without title, but our buyers are usually pretty flexible. You will need to prove you own the vehicle by presenting a photo ID that matches your valid insurance and or registration. Your offer may also be much lower without title than with. 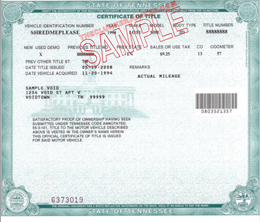 Tennessee often changes their title documents from year to year. If you have questions about your specific title, please contact your Tennessee clerk’s office. Yes, unless you are transferring the plates to a new vehicle. You can return the plates to your local county clerk’s office. We buy cars in Tennessee and provide a Stress-Free Service! The Clunker Junker’s service offers the best instant price estimations, free towing, and great customer service that will have you singing like you’re in Nashville. Now that you’re armed with the knowledge that you can get cash for your junk car in Tennessee, what are you waiting for? It’s time to take control and get your free quote today! "I bought the car from a friend who bought it from an auction. Since I got it, I've had transmission problems. It's drivable to a certain extent but needs work. The only panel missing on the outside is the bumper. The person I bought it from lost the title but understands why I'm junking it. The deck player is gone, and there's a little rust to the emergency brake gear." "Please call me about the title. Two of the five blocks are filled out by a would-be purchaser from September of 2015 which is my ex-girlfriend. She totaled the car without legally transferring the title. It sits in my yard, and I want it gone." "My mother lives in another state and will fax over her license. I was driving the vehicle, but it's in her name, and we need to junk it due to me moving from this house. We are looking to junk it for cash this week. " "The vehicle just won't start. It ran great one day, and the next morning it wouldn't start. I cant get the title yet. It is registered to me. I need some cash for an emergency. Please help. " "The vehicle's heads might be gone on the motor, or it may be the head gasket. I'm not sure what it is. I just don't want to put any more cash into it. The transmission still works. Everything is still in the car except for the radio. It's still a full car." "I believe the transmission is going out, or it's just the oil leak that's making it sputter. It just got new brakes and wheel bearings, and the front chassis were replaced as well. I just need a new car. " The Clunker Junker is one of the top junk car buyers in the state of Tennessee. To date we have made instant offers on over 20 thousand vehicles across the state, totaling over $5.8 Million offered! Of those vehicles, approximately 16% were purchased without a title. We also buy cars on a wide spectrum of conditions and 63% of the vehicles we've made offers on in Tennessee do not start or drive. Many also have moderate to severe body damage. Nashville in Howard County was our top producer, followed by Memphis.